As with every series designed by Surveyor, a premium is placed on superior craftsmanship and unmatched value. 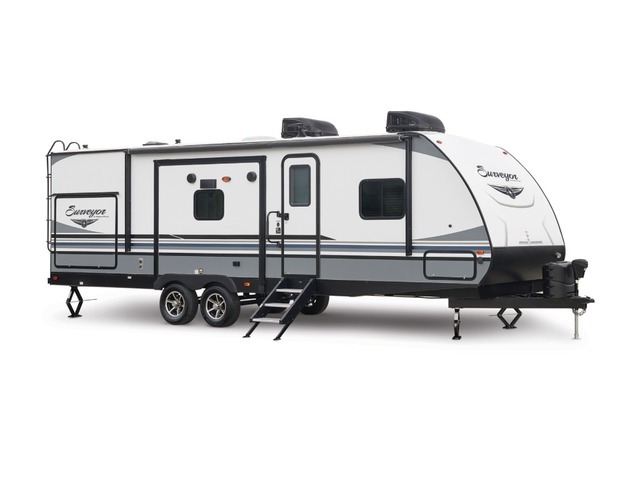 By combining lightweight floor plans and efficient design, Surveyor delivers superior camping comfort. No need to make sacrifices while you travel. Surveyor boasts standard seamless kitchen countertops, 22" ovens (where applicable) with a recessed glass stove cover and a residential pull out sprayer faucet. Modern conveniences on the road. Surveyor's selection of family coaches is sure to cover your family camping needs. From smaller light weight models to the largest with a triple slide, Surveyor has something to fit your family. Dry Weight 3,599 lbs Hitch Weight 300 lbs Overall Length 23' 4"
Dry Weight 3,594 lbs Hitch Weight 360 lbs Overall Length 23' 4"
Dry Weight 4,601 lbs Hitch Weight 480 lbs Overall Length 23' 8"
Dry Weight 4,209 lbs Hitch Weight 491 lbs Overall Length 24' 5"
Dry Weight 5,137 lbs Hitch Weight 517 lbs Overall Length 25' 11"
Dry Weight 4,961 lbs Hitch Weight 540 lbs Overall Length 27' 0"
Dry Weight 5,504 lbs Hitch Weight 610 lbs Overall Length 29' 11"
Dry Weight 4,886 lbs Hitch Weight 651 lbs Overall Length 29' 4"
Dry Weight 5,995 lbs Hitch Weight 777 lbs Overall Length 33' 0"
Dry Weight 7,404 lbs Hitch Weight 748 lbs Overall Length 37' 1"
Dry Weight 7,581 lbs Hitch Weight 796 lbs Overall Length 37' 1"